Massachusetts AFL-CIO president Steven A. Tolman (top center) addresses the crowd at Thursday’s rally. At left is Representative Paul Brodeur and at right is state Treasurer Deb Goldberg. 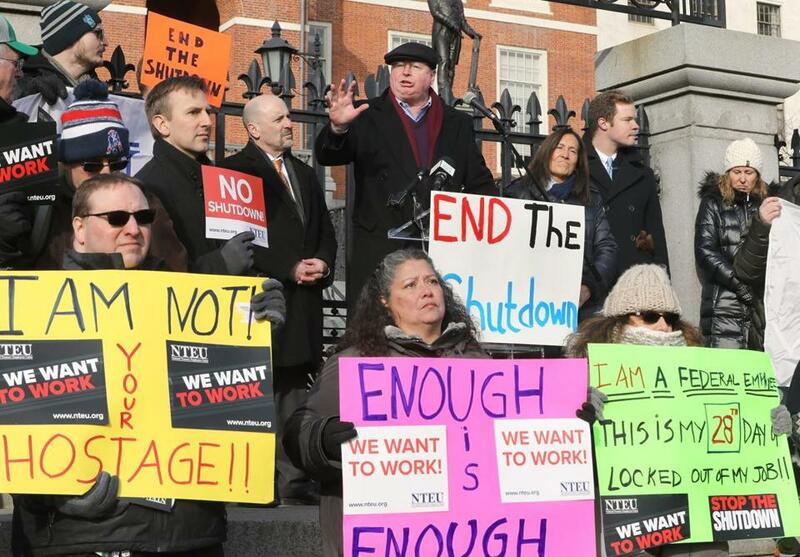 Furloughed federal employees and their supporters rallied in front of the State House on Thursday to demand an end to the 27-day government shutdown. Beyond the outcries of frustration lurked a growing anxiety. Bundled up against the 27-degree weather, about 100 people gathered, many carrying signs with such slogans as “No pay? No way!” and “We want to work!” The consensus: They are fed up with being barred from doing their jobs amid political warfare in Washington. “I don’t think middle-class federal employees should be treated as pawns,” said Greg Gilman, president of Chapter 293 of the National Treasury Employees Union and an attorney for the Boston office of the Securities and Exchange Commission. The hourlong rally was led by state Representative Paul Brodeur. Brodeur, a Melrose Democrat, believes there is a need for the Massachusetts government to understand the broader effects of the shutdown, potentially by creating a task force to assess the matter. He is also worried about the possibility of losing, or not being able to apply, for federal grants. In New England, the shutdown is being felt in a variety of ways. Here’s a breakdown by state, and a look at some cascading problems that could arise. Hardly a few minutes passed without cars honking in support as they passed by, a display answered by cheers from the protesters. 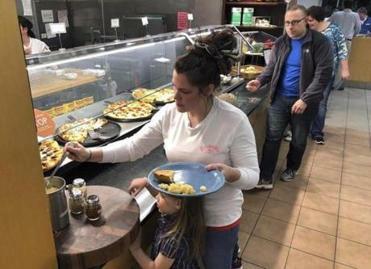 Many said they are relying on credit to weather the shutdown, which, to some, has no end in sight. People are deferring on mortgages and are even rationing medications, said Gary Karibian, an IRS phone administrator in the region. Many protesters worry not only about their own fate, but that of the American people. “You could have contraband weapons coming in, weapons of mass destruction,” said Richard Dargon, an auditor for Customs and Border Protection in Boston. As for opinions on when the shutdown might end?